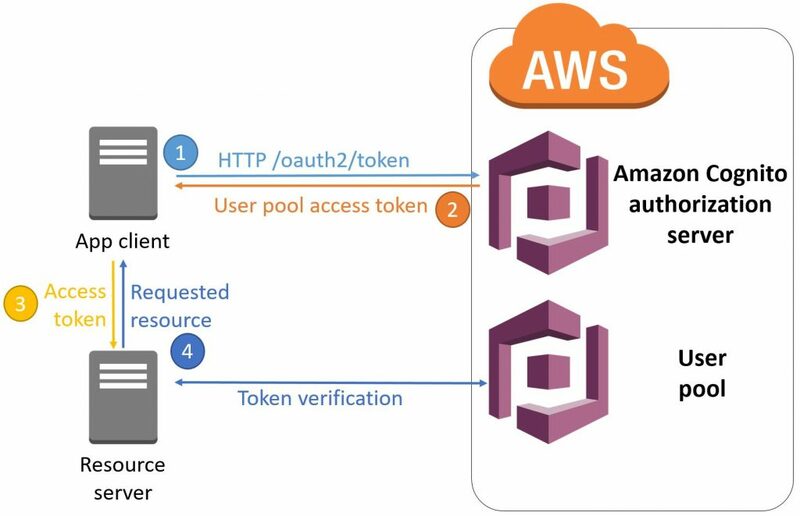 In addition to using the Amazon Cognito-specific user APIs to authenticate users, Amazon Cognito user pools also support the OAuth 2.0 authorization framework for authenticating users. After you configure a domain for the user pool, Amazon Cognito automatically provisions a hosted UI that enables you to easily add a federated, single sign-on experience to your website. Behind the scenes, the hosted UI accesses HTTPS endpoints (also provisioned by Amazon Cognito) that implement parts of the OAuth 2.0 framework. The flow for obtaining user pool tokens varies slightly based on which grant type you use. While each of these grant types is defined by the OAuth 2.0 RFC document, certain details about the endpoints are open ended. The following sections describe the flows as specific to the Amazon Cognito user pools implementation. These details can help you to customize and debug implementations that use third-party identity providers to federate into Amazon Cognito. They may also provide insight into which grant flow suits your application best. The authorization code grant is the preferred method for authorizing end users. Instead of directly providing user pool tokens to an end user upon authentication, an authorization code is provided. This code is then sent to a custom application that can exchange it for the desired tokens. Because the tokens are never exposed directly to an end user, they are less likely to become compromised. response_type – Set to “code” for this grant type. client_id – The ID for the desired user pool app client. redirect_uri – The URL that a user is directed to after successful authentication. state (optional but recommended) – A random value that’s used to prevent cross-site request forgery (CSRF) attacks. An ID token is only generated if the openid scope is requested. The phone, email, and profile scopes can only be requested if openid is also requested. A vended access token can only be used to make user pool API calls if aws.cognito.signin.user.admin is requested. identity_provider (optional) – Indicates the provider that the end user should authenticate with. idp_identifier (optional) – Same as identity_provider, but doesn’t expose the provider’s real name. code_challenge (optional, is required if code_challenge_method is specified) – The hashed, base64 URL-encoded representation of a random code that’s generated client side. It serves as a Proof Key for Code Exchange (PKCE), which prevents attackers from being able to use intercepted authorization codes. code_challenge_method (optional, is required if code_challenge is specified) – The hash algorithm that’s used to generate the code_challenge. Amazon Cognito currently only supports setting this parameter to “S256“. This indicates that the code_challenge parameter was generated using SHA-256. A CSRF token is returned in a cookie. If an identity provider was specified in the request from step 1, the rest of this step is skipped. The user is automatically redirected to the appropriate identity provider’s authentication page. Otherwise, the end user is redirected to https://AUTH_DOMAIN/login (which hosts the auto-generated UI) with the same query parameters set from step 1. Here they can either authenticate with the user pool or select one of the third-party providers that’s configured for the designated app client. If the user uses the native user pool to authenticate, the hosted UI submits the user’s credentials through a POST request to https://AUTH_DOMAIN/login (including the original query parameters), along with some additional metadata. If the user selects a different identity provider to authenticate with, the user is redirected to that identity provider’s authentication page. After successful authentication the provider redirects the user to https://AUTH_DOMAIN/oauth2/idpresponse with either an authorization token in the “code” query parameter or a SAML assertion in a POST request. After Amazon Cognito verifies the user pool credentials or provider tokens/assertion it receives, the user is redirected to the URL that was specified in the original redirect_uri query parameter. The redirect also sets a code query parameter that specifies the authorization code that was vended to the user by Amazon Cognito. grant_type – Set to “authorization_code” for this grant. code – The authorization code that’s vended to the user. client_id – Same as from the request in step 1.
redirect_uri – Same as from the request in step 1.
code_verifier (optional, is required if a code_challenge was specified in the original request) – The base64 URL-encoded representation of the unhashed, random string that was used to generate the PKCE code_challenge in the original request. If the client app that was used requires a secret, the Authorization header for this request is set as “Basic BASE64(CLIENT_ID:CLIENT_SECRET)“, where BASE64(CLIENT_ID:CLIENT_SECRET) is the base64 representation of the app client ID and app client secret, concatenated with a colon. id_token – A valid user pool ID token. Note that an ID token is only provided if the openid scope was requested. access_token – A valid user pool access token. refresh_token – A valid user pool refresh token. This can be used to retrieve new tokens by sending it through a POST request to https://AUTH_DOMAIN/oauth2/token, specifying the refresh_token and client_id parameters, and setting the grant_type parameter to “refresh_token“. expires_in – The length of time (in seconds) that the provided ID and/or access token(s) are valid for. token_type – Set to “Bearer“. * Note that step 3 is handled in one request via the /login endpoint if the user authenticates directly with the user pool instead of using a third-party identity provider. Only use the implicit grant when there’s a specific reason that the authorization code grant can’t be used. In an implicit grant, user pool tokens are exposed directly to the end user. As a result, the ID and access tokens have more potential to become compromised before they expire. On the other hand, if your setup doesn’t contain any server-side logic, you may want to use the implicit grant to prevent refresh tokens from being exposed to the client, as the implicit grant does not generate refresh tokens. token_type – Set to ” Bearer“. Note that no refresh token is returned during an implicit grant, as per the RFC standard. The custom application that’s hosted at the redirect URL can then extract the access token and ID token (if they’re present) from the query parameters. Before trusting any claims in these tokens, however, it’s crucial that the application first validate the tokens to ensure that no spoofing or tampering has occurred. * Note that step 3 is handled in one request through the /login endpoint if the user authenticates directly with the user pool instead of using a third-party identity provider. The client credentials grant is much more straightforward than the previous two grant types. While the previous grants are intended to obtain tokens for end users, the client credentials grant is typically intended to provide credentials to an application in order to authorize machine-to-machine requests. Note that, to use the client credentials grant, the corresponding user pool app client must have an associated app client secret. grant_type – Set to “client_credentials” for this grant type. scope – A space-separated list of scopes to request for the generated access token. In order to indicate that the app is authorized to make the request, the Authorization header for this request is set as “Basic BASE64(CLIENT_ID:CLIENT_SECRET)“, where BASE64(CLIENT_ID:CLIENT_SECRET) is the base64 representation of the app client ID and app client secret, concatenated with a colon. expires_in – The length of time (in seconds) that the provided access token is valid for. Note that, for this grant type, an ID token and a refresh token aren’t returned. The app uses the access token to make requests to an associated resource server. The resource server validates the received token and, if everything checks out, executes the request from the app. As always, we’d love to hear from you. Please comment below or reach out to us on the Amazon Cognito Forum.